Decals Around The World	There are 4 products. 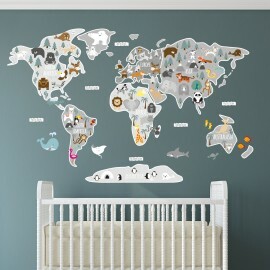 Captivate your growing childs imagination with our fantastic children's map of the world wall decals featuring lots of animals from all corners of the world. Simply peel and stick to create an educational space within hours! Featuring a friendly Koala, and Kangaroo's in our Australian Animals Nursery Wall Decals. Create a magical setting within hours with our premium self adhesive fabric nursery wall art.